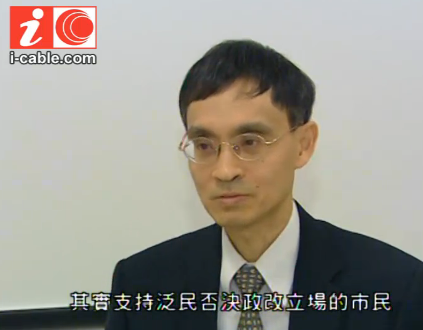 In a television interview with Cable TV, Chan Professor of Constitutional Law, Albert Chen, discusses his new ideas of conducting a credible public opinion survey chaired by a former judge such as the former Chief Justice to assess whether Hong Kong people would like legislators to accept or veto the government's universal suffrage reform proposal (which has yet to be officially announced). He also proposes holding a televised debate between representatives from the government and the pan-democrat camp like the debate held in June 2010 between Chief Executive Donald Tsang and Civic Party leader, Ms Audrey Eu. These new proposals come after it has become apparent that neither the government nor the legislators supported Professor Chan's earlier proposal to include a 'none of the above' option for voters to reject all candidates. Click here to view the interview (in Cantonese).